Recurrent patellar instabilty can culminate in a vertically rotated and a locked patellar dislocation which requires open reduction along with a patellar realignement procedure. Department of Orthopaedics, PGIMS, Rohtak, Haryana. India. Professor, MS Orthopaedics and 40/9J, Medical campus, PGIMS,Rohtak. Haryana. India. Introduction: Locked vertical patellar dislocations are rare and pose a therapeutic challenge. This case is more unusual, as the patient was a known case of recurrent patellar dislocation and presented with an atraumatic locked and vertically rotated patellar dislocation. This type of presentation has never been reported in literature to the best of our knowledge. Case presentation: A 14-year-old healthy male child with previous history of recurrent lateral dislocation of patella presented to accident & emergency department with complaints of inability to walk or bear weight on his left lower limb after he spontaneously dislocated his patella while running on uneven ground. Radiographs revealed a laterally displaced and vertically rotated patella along its long axis with the medial patellar edge locked and dipping into the lateral gutter. Open reduction was performed along with lateral patellar retinacular release with medial patellar retinaculum plication, to achieve satisfactory patellar stability and patellofemoral tracking. Conclusion: We would recommend that in the settings of patella being vertically dislocated and locked, open reduction would be the management of choice, as these types of dislocations are difficult to relocate by closed reduction. Repeated attempts of closed reduction may cause osteochondral damage. Open reduction not only yields better outcomes but also allows the surgeon to perform patellar realignment procedures in order to prevent further patellar dislocations in cases of prior patellar instability. Keywords: Patella, vertical dislocation, locked, patellar instability, open reduction. A case of locked patellar dislocation with vertical axis rotation was first described in literature by Cooper in 1844 . Since then only a handful of cases about the condition have been reported. Intra articular patellar dislocations can be superior or inferior or can be horizontal or vertical. Locked vertical dislocation of patella is a rare entity and poses a therapeutic challenge in which closed reduction often requires a general anaesthetic or, may require an open procedure . There have been no published reports on recurrent patellar instability culminating in a vertically rotated and a locked patellar dislocation. We report an unusual case of lateral recurrent dislocation of patella in a 14-year-old healthy child who presented with vertically rotated and locked patella without any history of trauma, which required an open reduction along with proximal extensor apparatus realignment procedure. A 14-year-old healthy male child presented to accident & emergency department with complaints of inability to walk or bear weight on his left lower limb after he spontaneously dislocated his patella while running on uneven ground. Upon further inquiry, the patient gave a history of similar episode 10 months back following a fall. At that time, his mother pushed the patella back after which he was taken to the hospital where radiographic images showed that patella was reduced with no associated fracture of patella, tibial tuberosity or femoral condyles. He was given a full length leg cast for 1 month after which he was able to resume his daily activities without any difficulty. There was a family history of recurrent patellar dislocation (father). Previous hospital records revealed that he had history of anterior knee pain with a positive apprehension sign indicating lateral patellar instability. On examination, the knee was markedly swollen with obvious deformity in the lateral aspect in the form of tenting of the skin and soft tissue by underlying patella without any contusion or bruise. 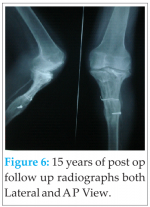 The knee was locked in 15 degrees of flexion and patient was unable to perform any movements at the knee joint. A provisional diagnosis of lateral dislocation of patella was made. Standard anteroposterior and lateral plain radiographs were taken which showed a laterally displaced and vertically rotated patella along its long axis with the medial patellar edge locked and dipping into the lateral gutter (Fig. 1). There was no evidence of associated fracture or signs of osteochondral damage. General examination showed no hyperlaxity of the joints. Clinical signs of genu valgum, patella alta, tibial torsion or trochlear dysplasia were absent and the Quadriceps (Q) angle on the normal limb was within normal range (11 degrees). An attempt to closed reduction was made under conscious sedation but was not successful. A decision for open reduction was made and patient was shifted to operating room. A midline vertical incision was given along the knee joint. The patella was found to be locked with its articular surface facing laterally and the medial edge of patella locked past the lateral femoral condyle and wedged into the lateral gutter. The medial patellar retinaculum was found stretched and attenuated but no tear or defect was noticed.A small incision was given along the lateral retinaculum, the index finger inserted was through it and the wedged medial patellar edge was freed from the lateral femoral condyle; and at the same time lifting the patella out of the lateral gutter, it was relocated to its anatomical position. The stability and tracking of the patella was checked and it showed a tight lateral retinaculum along with a lax medial retinaculum. Release of the lateral retinaculum was done along with medial patellar retinaculum plication using multiple interrupted prolene sutures (Fig. 2). Patellar stability and tracking was rechecked and found to be good. Standard skin closure was done and a long leg hinged knee immobiliser was applied. Post operative radiograph showed patella relocated in the trochlear groove (Fig. 3). Patient was allowed full weight bearing on day one. Quadriceps setting exercises and active straight leg raising were started in the second post operative week. Progressive active and passive range of motion exercises were started after 3 weeks and full range of motion was achieved by 7 weeks. Patient resumed his sporting activities by 6 months post operative with no recurrence or any symptoms at the time of final follow up of 18 months. Lateral dislocation of patella is a common entity in adolescents, whereas rotational dislocation of patella which involves rotation of patella along the horizontal or vertical axis is quite rare . In vertical dislocation, the patella rotates along its long axis with the articular surface of the patella facing laterally and gets locked into the lateral gutter . Vertical patellar dislocations pose a therapeutic challenge to the orthopaedic surgeons and are difficult to reduce by closed methods . Repeated attempts at manipulation can lead to osteochondral fractures, which necessitates open methods to reduce the vertical dislocations. 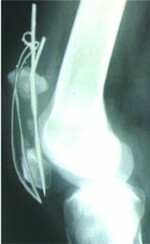 Most of the patellar dislocations are seen with direct blow to the medial aspect of patella with knee in near extension or due to indirect force causing sudden contraction of quadriceps muscles while the knee is stretched in valgus and the tight quadriceps act as a bow string and prevents relocation . Pre-disposing factors are anatomical variations such as shallow inter condylar groove, patellar hypermotility, patella alta and tibial torsion . In this report, we review a case of lateral dislocation of patella which is of interest; in that it was vertically rotated locked dislocation of patella which was atraumatic i.e with no direct trauma to the patella in an individual with a history of recurrent dislocation of patella. There was no clinical evidence of medial patella-femoral ligament tear or any radiological evidence of trochlear dysplasia, patella alta, or shallow inter condylar groove. Similar cases have been reported previously in the literature but with a concomitant history of trauma. Hackl et al reported a locked dislocation with bony avulsion of medial structures after fall .Corso et al reported a lateral dislocation with vertical rotation by laterally directed blow to patella during wrestling . Gidden and bell reported a vertically rotated irreducible patella due to medial border force in femur as a result of motor bike accident . Only a handful of cases have been reported in literature in whom there was no history of direct trauma. Gann and Nalty reported a vertical patellar dislocation in a 10 year old girl without any trauma . Michels et al reported a locked patellar dislocation in a 16 year old girl while she was dancing . This case report is rare in the sense that there was no history of direct trauma preceding the dislocation and the mode of dislocation was running over uneven surface. Although from literature review it is apparent that these types of dislocations are mainly traumatic and result from direct blow to medial side of knee, it is to be assumed naturally that the medial attachments of the knee joint would be torn in such circumstances; but nevertheless, a locked dislocated patella may occur in atraumatic patients with prior history of dislocation without any damage to attachments along the medial border which provides the major support in preventing lateral dislocations. During surgery also, we found that the medial retinaculum to be stretched and lax with no defect or apparent tear, the lateral retinaculum was found to be tight and that the intra operative tracking of patella was abnormal. Following the proximal patellar realignment procedure in the form of medial retinacular plication and lateral retinacular release, the patella was found to be tracking well in the trochlear groove. The tight lateral retinaculum with lax medial patellofemoral ligament could be related to previous episodes of recurrent patellar instability and one episode of lateral dislocation of patella in our case. Hence, we would recommend that in the settings of patella being vertically dislocated and locked, open reduction would be the management of choice as these types of dislocations are difficult to relocate by closed reduction. Repeated attempts of closed reduction may cause osteochondral damage. Open reduction not only yields better outcomes but also allows the surgeon to perform patellar realignment procedures in order to prevent further patellar dislocations in a setting of prior patellar instability. Open reduction should be performed in vertically rotated locked patellar dislocations. Open reduction avoids osteochondral damage associated with repeated attempts of closed reduction and allows the surgeon to perform patellar realignment procedures in order to prevent further patellar dislocations in a setting of prior patellar instability. 1. Cooper A. A treatise on the dislocations and fractures of the joints. Philadelphia: Lea and Febiger; 1844. p.178. 2. Corso SJ, Thal R, Forman D. Locked patellar dislocation with vertical axis rotation: A case report. ClinOrthop 1992;279:190–3. 3. Frangakis EK. Intraarticular dislocation of the patella. J Bone Joint Surg Am1974;56:423–4. 4. Levin GD. Vertical axis rotational dislocation of the patella. Orthop Rev 1978;7:83. 5. Gupta RK, Gupta V, Sangwan SS, Kamboj P. Neglected locked vertical patellar dislocation. Indian J Orthop 2012;46:581-4. 6. Phaltankar PM, Bridle SH. Locked lateral patellar dislocation with impaction fracture of patella. Ann R CollSurgEngl 2002;84:125-6. 7. Hackl W, Benedetto K, Fink C, Sailer R, Rieger M. Locked lateral patellar dislocation : a rare case of irreducible patellar dislocation requiring open reduction. Knee Surg Sports TraumatolArthrosc 1999;7:352-5. 8. Gidden DJ, Bell KM. An unusual case of irreducible intra-articular patella dislocation with vertical axis rotation. 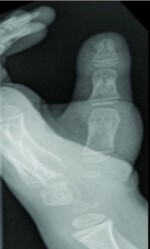 Injury 1995;26:643–4. 9. Gann N, Nalty T. Vertical patellar dislocation: A case report. J Orthop Sports PhysTher 1998 ;27:368–70. 10. Michels F, Pouliart N, Oosterlinck D. Locked patellar dislocation: a case report. J Med Case Rep 2008;2:371.